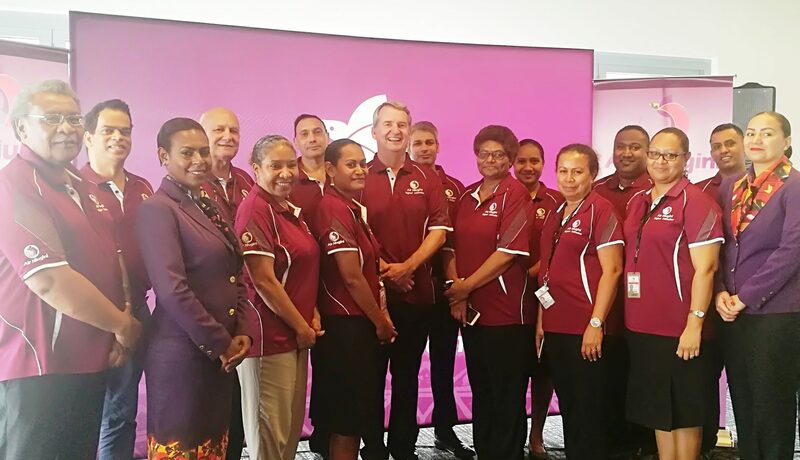 Air Niugini Managing Director, Mr Alan Milne yesterday (Tuesday 19th March) announced a new, exciting program that aims to transform Air Niugini from a good airline into a great airline. Called Higher Altitude, the program looks at four main areas; Cost Control, Revenue opportunities, our People and Customer and operational excellence. Mr Milne said the Air Niugini’s future fleet decision will be a big one – any airline making a fleet decision requires a lot of work, very long lead times, and is usually a very difficult one as the economic conditions when new aircraft arrive are often vastly different from when the aircraft are first ordered. However, Air Niugini has done pretty well up to this point. Another important area the program is focusing on is the airline employees and what can be done to develop the next generation of leaders, executive talents and basically to ensure that all staff members are involved and engaged. “If our staff are engaged and we give them the right tools and resources to deliver their work, they will ensure reliable service standards, schedules and all round customer satisfaction.” Mr Milne said. The fourth and final area of focus is customer experience. Without a good, safe and compliant operations and customer proposition, we really don’t have an airline, hence it is very important for us to retain this and build on it further. Mr Milne said “ We have to focus on customers like we have never had to before – the whole end to end customer proposition – that’s from making the booking on the website to the check-in experience, schedule, aircraft availability, the lounge experience, inflight entertainment, the food that we serve, and the service standards that Air Niugini is so well known for. For now and during the first year, Higher Altitude program is kicking off by prioritizing , setting up the governance structure, getting the project running, seeing what projects are out – the project will not only remain as a program but will transit to becoming business as usual. “This is not about a senior executive running a program to transform the airline. It is something the whole Air Niugini family has to be involved in. It is about turning a really good airline into a great airline and that’s going be a process and a path we all follow.” Mr Milne concluded.